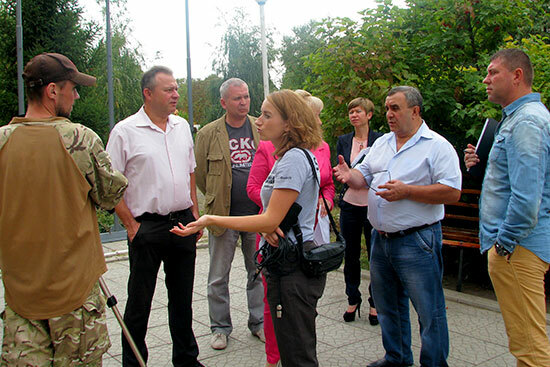 A team of project “Donbas: True” visited Luhansk Taras Shevchenko National University on September 22. “Donbas: True” is a project of “Telekrytyka” production in cooperation with the Association of Journalists of the Republic of Poland. It was created within Poland-Canada Democracy Support Program in association with the Ministry of Internal Affairs of Poland and Canada. Program stories are prepared by 40 regional journalists in partnership with regional state television and radio companies. The idea of the project is following: a group of journalists from different regions of Ukraine comes to the front-line territories of Donetsk and Luhansk regions and tells what is happening around. The group includes journalists from Kyiv, Lviv, Khmelnytskyi, Ivano-Frankivsk and Mykolaiv. This is the sixth group of media members who come to Donbas. The previous ones were in Donetsk region and in some cities of Luhansk region – Rubizne, Sievierodonetsk and now in Starobilsk. Now the group covers the subject of universities that have moved from the occupied territories, their development, work and education processes. The journalists communicated with the university administration and students, attended a lection in “Ukrainian Language (in Professional Direction)” for the first-year students of all specialities of the Institute of Pedagogy and Psychology, visited student and teacher’s dormitories. Media members were interested in the features of distance learning in LNU and university activity entirely, everyday life of students and teachers. Special attention was paid to the students’ life in Starobilsk and their attitude to the events in region and university.